With so many pass roads to choose from when leaving Sterzing (Vipeteno), the selection is difficult - pleasantly difficult. Why not cycle to a place, that has just as many choices as Sterzing ? In that case the route would go over Jaufenpass, a road reaching above two thousand meters, that has a fairly high cult status with cyclists - and at the destination the choice of routes is at least as hard as at the departure point, because there are just so darn many attrative routes to choose from. Jaufenpass connects the Jaufental (val Giovo) from Sterzing, with the Passaiertal leading to Sank Leonard and Meran. Meran and Vipeteno are veritable hubs on spoked bicycle wheels, with the passes playing the role of the spokes. 05. (36.7km,716m) START-END WEST: Sankt Leonhard, jct: via Passo Giovo - Mooserstr. From East. If approaching Sterzing from downvalley Brixen, one can take a bike path all the way to Sterzing. This bike road has many more ups and downs and requires considerably more effort than the regular road. But it has much better views too when approaching Sterzing. A traffic circle south of Sterzing points the way to several passes. One of them is Jaufenpass. The bike path soon ends at another traffic circle, where two valleys branch off. The road starts climbing with switchbacks that are numbered and labeled with altitude. The distance between switchbacks is quite long, so that every turn gets the cyclist one or serveal hundred meters higher. The view is up the Ridnautal. The highest peak there is the Wetterspitze at 2709. The view on the valley keeps improving if the clouds play along, until the road turns south away from the valley and enters a deep forest. About 250m below the summit the road suddenly rises above treeline and traverses along a breadloaf shaped mountain. It passes a Jaufenpass Hotel, still several hundred feet below the summit, and then climbs the pass with several switchbacks. The top has a small restaurant, which is relatively uncommercialized for a pass in the alps. A short walk from the pass, south direction Jaufenspitze improves the view considerably. From West. (described downwards) The topographical drop down into the Passaiertal is much steeper than from the east side, even though the road is about equally steep. It just requires a more adventurous road construction. In order to negotiate the dropoff, the road heads north along the treeless slope, bordered by a low stone wall, and supported by a much higher wall at the drop off. It then switches back in a long traverse direction Jaufenspitze. It enters forest, then switches back again. Even after thousands of feet of descent the church tower down in the Passaiertal hardly seems to have come much closer. The highest settlements above Sankt Leonard appear glued to the hillside, long before the road enters the deep slit, where the village itself lies. As these houses disappear from the upper field of view, obscured by the sheer slope of the mountain, the bike rolls into Sankt Leonard. The inner town core spans itself at least a hundred feet of elevation. The tourist info center is in the lower part, and the few economical penisons are in the upper part of town, so it may be wise to spare a little energy till the end. 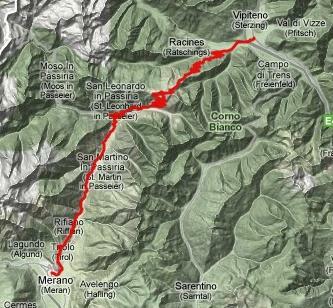 The elevation profile continues further to Meran. Jaufenpass: Kiens (some kms west of Bruneck) > cyling path/route to Sterzing > Jaufenpass > Sankt Leonard: 57 miles with 6050ft of climbing in 6 hours (VDO MC1.0 m4:9.6.29). Notes: includes several errants in Sankt Leonard.